Mr. Angel Gurría, Secretary-General of the OECD, was in Bratislava on 19 February 2016 on an official visit to the Slovak Republic. Mr. Gurría received the International Peace Prize from Slovakia 2015 Award, granted by the Slovak Chamber of Commerce and Industry. The Secretary-General also presented two OECD reports: Vocational Education and Training - A Skills beyond School Review: Slovak Republic and Reviews of School Resources: Slovak Republic, alongside Mr. Juraj Draxler, Minister of Education, Science, Research and Sport. During his trip to Bratislava, Mr. Gurría held several meetings with Deputy Prime Ministers and Ministers of the Slovak Republic. 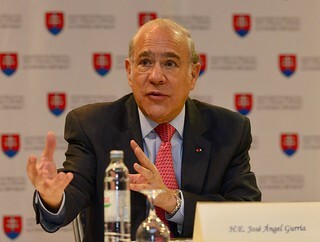 19 February 2016 - OECD Secretary-General Angel Gurría speaking in Bratislava.